Administration of the pneumococcal vaccine to inpatients more than 65 years old with community‐acquired pneumonia (CAP) is a measure of hospital quality according to the Joint Commission on Accreditation of Healthcare Organizations and CMS. Hospitalists caring for patients with CAP are under increasing pressure (internal, external, and financial) to increase vaccination rates. The most successful hospitals rely on computerized physician order entry (CPOE) or the use of standing orders. Hospitals without these systems in place must rely on alternative means to increase vaccination rates. The goal of the study was to engage clinical pharmacists in improving pneumococcal vaccination rates in elderly patients (> 65 years old) admitted to the hospital with a diagnosis of community‐acquired pneumonia. Our large, urban academic medical center does not have CPOE, and because of hospital‐specific policies and procedures, we could not implement a standing‐order policy to improve vaccination rates. After educational conferences for residents and attendings and extensive “cheerleading” failed to improve vaccination rates, we engaged our clinical pharmacists. At our institution, each team on the medical service works closely with a staff pharmacist or pharmacy student. In 2003 we established a system by which all patients more than 65 years old admitted to the medical service (not just those with CAP) were screened for possible pneumococcal vaccination by clinical pharmacists. If a patient had been previously vaccinated or had an absolute contraindication to vaccination, the pharmacist would document this in the medical record. For those eligible for vaccination, the pharmacist would contact the physician responsible for the patient (typically the intern) and ensure ordering of the vaccine. Based on the success of this initiative, we engaged clinical pharmacists on all inpatient services at our hospital, who began screening all patients more than 65 years old. In conjunction with this systematic screening, hospitalists led educational conferences for attendings, residents, nurses, and pharmacists to increase and maintain awareness of this quality improvement program. With implementation of pharmacy‐led screening, our in‐patient rate of pneumococcal vaccination of patients older than 65 with CAP increased from 8% in 2002 to 93% in 2006 (see figure for data from quarter 3, 2004 onward). In addition, we screened and vaccinated hundreds of other patients more than 65 years old admitted to the hospital with other diagnoses. Hospitals without CPOE should consider engaging other allied health professionals to improve inpatient pneumococcal vaccine rates. At our institution, clinical pharmacists in conjunction with hospitalists and nurses were able to substantially increase vaccination rates. B. A. Sharpe, None; T. Bookwalter, None. 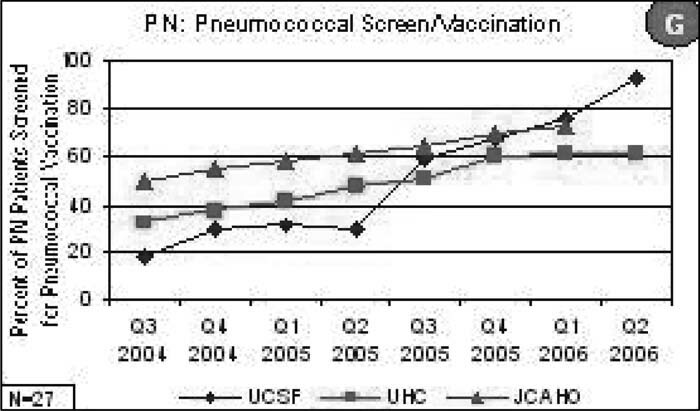 Sharpe B, Bookwalter T. A Successful Strategy to Improve Inpatient Pneumococcal Vaccination. Abstract published at Hospital Medicine 2007, May 23-25, Dallas, Texas Abstract 99. Journal of Hospital Medicine. 2007; 2 (suppl 2). https://www.shmabstracts.com/abstract/a-successful-strategy-to-improve-inpatient-pneumococcal-vaccination/. Accessed April 25, 2019.